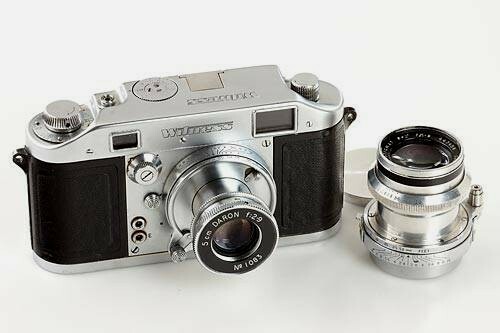 No compendium of Ilford cameras would be complete without mention of the Witness, a precision 35mm interchangeable lens rangefinder camera, equal to (even superior to) the contemporary (pre-M3) Leica. It was announced in 1947 and first shown at an exhibition around 1950, but did not actually reach the market until around mid-1952. 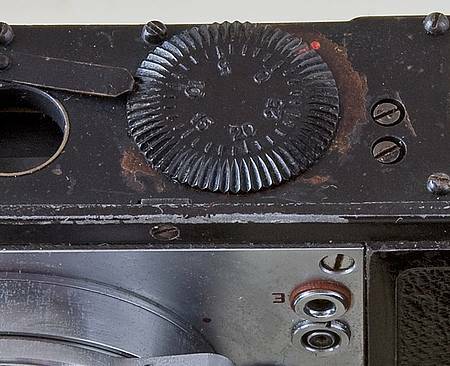 Andy Holliman, in his book, "The Cameras of Ilford Ltd, 1899-2005", has extensively researched the personalities and organisations behind the Witness design and manufacture, and devotes 24 pages to this camera. Below is just a very brief version of the history of the Ilford Witness, togther with photographs from various sources. For anyone wishing to know more about the Witness, I commend Andy Holliman's book to you. The Ilford Witness was initially a design exercise in 1945/47 by two German-Jewish refugees; ex-Leitz employee Robert Sternberg and ex-Zeiss employee Werner Julius Rothschild (often incorrectly stated as D.A.Rothschild). 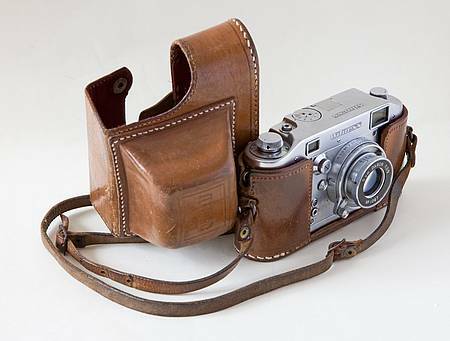 Thus, it incorporated attributes of both the Leica and Zeiss Ikon Contax rangefinder cameras. At this time, the Leica IIIC and Contax IIa cameras were just resuming production after WW2 and all new cameras were very scarce and expensive. In the late 1940's, SLR cameras were still under development and not in general use, so Leica and Contax 35mm rangefinders, Rolleiflex/Rolleicord roll film TLRs, and 5"x4" Speed Graphics were the photographic 'tools' of wealthy amateurs and serious photo-journalists. 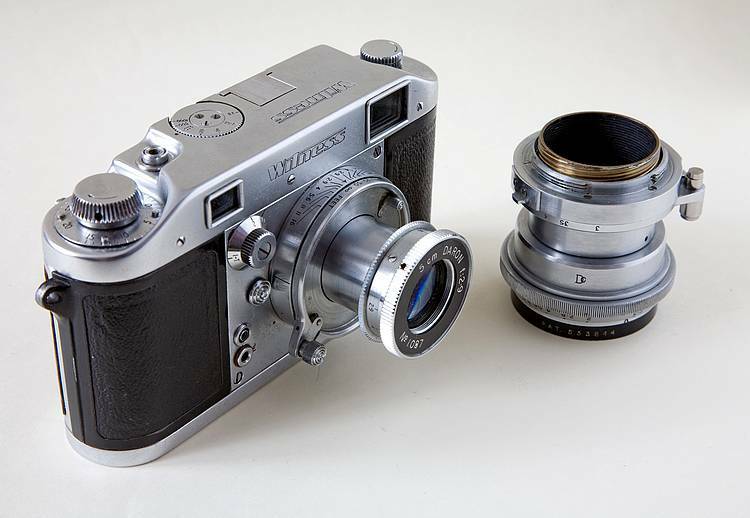 Sternberg and Rothschild approached Ilford in 1947 with their advanced 35mm rangefinder design. 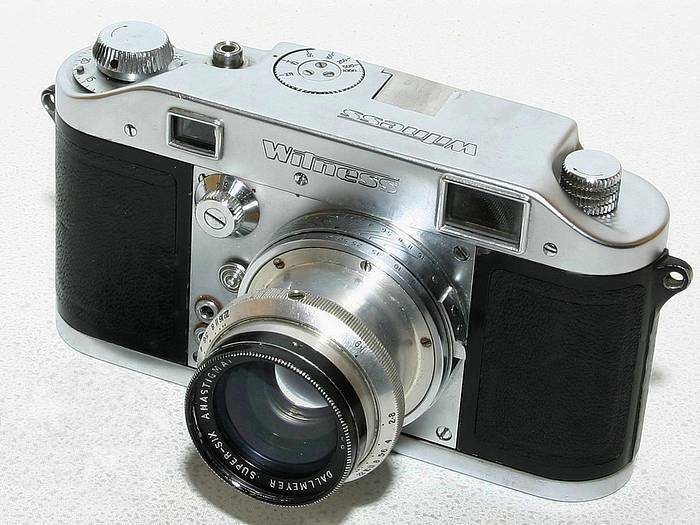 Ilford wanted to develop a range of cameras and thus agreed to manufacture the Witness. Initial examples were manufactured by designer Rothschild's company, Northern Scientific Equipment Ltd (NSE) at Bark Street, Bolton, Lancashire. But NSE were unable to handle bulk production. Early examples were offered with a f2.9 Daron lens, also made by Rothschild's company. However, production delays set in when the camera went into mass manufacture and by the time the camera was truly available (1953), manufacture was being handled by Peto Scott Electrical Instruments. The standard lens was then the f1.9 Dallmeyer Super-Six. Its price in April 1953 was £121.16s.8d (£121.83p). An advert in Amateur Photographer magazine for 1st April 1953, p27. There was pressure within the photographic industry to get new cameras onto the market in time to enjoy the sales boost anticipated due to the pending Coronation of Elizabeth II on 2nd June. 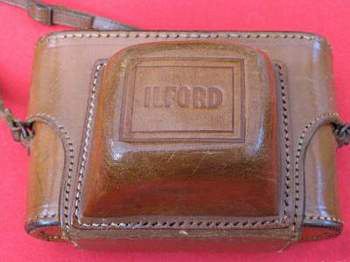 But sales were slow and Ilford soon decided to concentrate on less complex, lower cost, cameras, like the Advocate. Thus, production of the Witness ceased in 1953. The last of the cameras were 'remaindered' via Dollands and sold off at £80 each. The camera was not a commercial success partly because of poor marketing, partly because of under-development e.g lack of lenses and accessories compared to Zeiss and Leitz cameras, and partly because insufficient people in the UK had the money to buy such a camera. 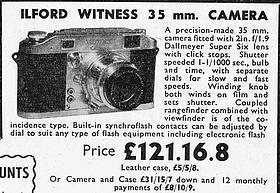 In December 1960, Hove Camera Co, Brighton, advertised a Witness with f1.9 Dallmeyer lens, secondhand, for £40 (Ref: Cameras & Equipment magazine). But nowadays, with only some 350 believed to have ever been manufactured, a good Witness can sell for £5,000 (see December 2002 Chrisite's auction) or (November 2015) even more, maybe £7,000. "It has the red metal ring binding on the spine side and a comb-like device between pages 14 and 15, believed to be original. The manual is 16cm in height and 11cm in width, consisting of 15 pages". These originals seem to sell for a price proportionate to the cost of the collectors valuation of the camera, so can reach £100. The one shown sold for £60. The British Journal of Photography, 21st March 1991, reported the death of Witness camera designer Robert Steinberg (sic - should read Sternberg). "....the man who designed one of the few precision 35mm cameras made in post-war Britain, has died at the age of 77. A German Jew, Sternberg came of age as the Nazis were taking power. 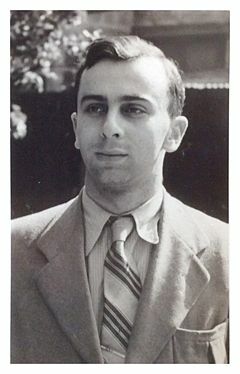 University education was denied him, but he was fortunate enough to be taken on by Ernst Leitz at the age of 18, training in optical design at the Leitz HQ in Wetzlar. Leitz's anti-Nazi sympathies extended to securing a job for Sternberg in England, and he emigrated to there in 1936. In the UK, Sternberg joined another German exile and ex-Zeiss employee, D A (sic.) Rothschild, who had started the Daroth camera company. 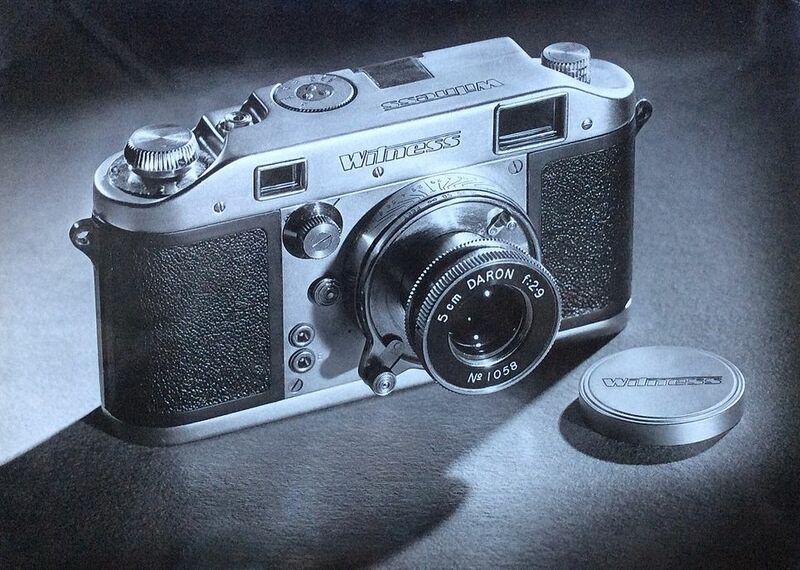 Sternberg set to work designing the 'Witness' camera in the 1940s, incorporating a number of features that for the time were ahead of anything available from the trailblazing Leica stable. Rothschild approached Ilford, who agreed to finance the Witness project. 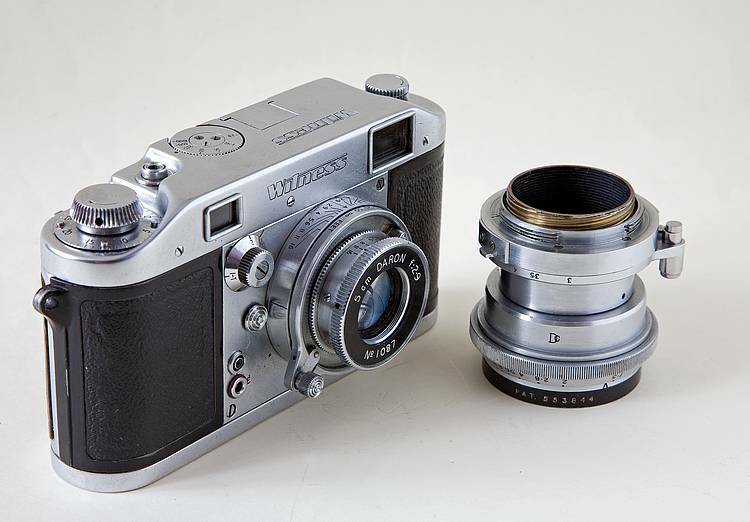 Delays in the manufacture of the camera meant that a working prototype appeared in 1951, but the camera did not reach the market until 1953 - by which time many of its features had lost their innovative quality: Leica released the M3 the following year. 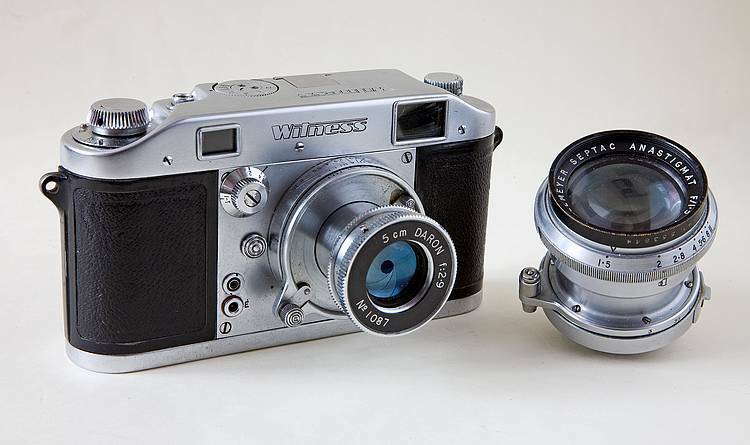 Notable features of the Witness included a removable back, a tripod bush placed centrally below the lens axis, and a special 'multi-tab bayonet' (lens mount). Sternberg went on to design optical scientific instruments, lecturing in optical physics, and working on astronomical (sic; should read 'optical', see below) spectrometers. The camera is now a sought-after collector's item." "....the British Journal of Photography says that my father, in later life, worked on "astronomical spectrometers". This should read "optical spectrometers". The mistake arose in his obituary in 'The Independent' which, for some reason, changed the word "optical" to "astronomical"! Robert actually co-wrote a classic, now rare, textbook called "The Design of Optical Spectrometers" while employed as a lecturer in the Physics Department at Manchester University. I have a copy of it." She recalls the Witness "being designed and perfected on our kitchen table in Manchester, ........it was a constant topic of conversation and discussion in our household!" The two photographs shown alongside, plus the letter (below) from Northern Scientific Equipment Ltd and the Witness advertising 'flyer' (following below), together with text based information, are all by courtesy of Hilary Sternberg. Robert Sternberg was born 19th January 1914. The picture to the left is of Robert at the age of 22, when he first arrived in England in 1936. Through the good offices of Ernst Leitz, he had taken a job in the Research and Experimental Department of the Houghton-Butcher camera company in Walthamstow, east London. 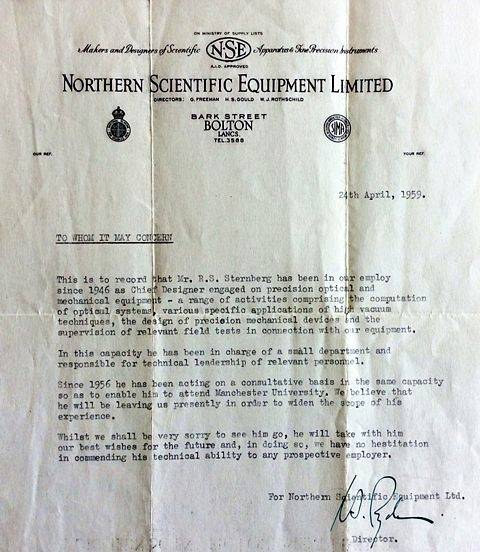 The letter shown left, dated 24th April 1959, is from Northern Scientific Equipment Ltd and signed by Werner Rothschild, who by then had changed his surname by deed poll to Ryden. In the list of Directors, near the top of the letter, Werner is still named as W.J.Rothschild (Werner Julius Rothschild). The other Directors are G.Freeman and H.S.Gould. The letter is a testimonial of Robert's technical abilities and good character "To Whom It May Concern". 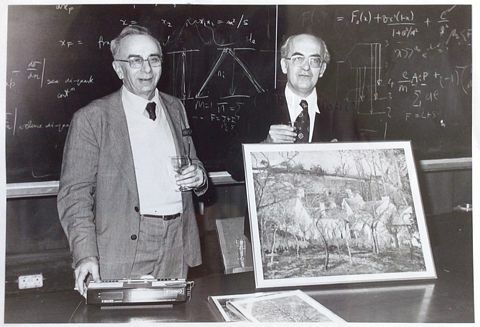 It was Werner's way of helping Robert to further his career, including joining The Physics Department at Manchester University. This is to record that Mr.R.S.Sternberg has been in our employ since 1946 as Chief Designer engaged on precision optical and mechanical equipment - a range of activities comprising the computation of optical systems, various specific applications of high vacuum techniques, the design of precision mechanical devices and the supervision of relevant field tests in connection with our equipment. In this capacity he has been in charge of a small department, and responsible for technical leadership of relevant personnel. Since 1956 he has been acting on a consultative basis in the same capacity so as to enable him to attend Manchester University. We believe that he will be leaving us presently in order to widen the scope of his experience. Whilst we shall be very sorry to see him go, he will take with him our best wishes for the future and, in doing so, we have no hesitation in commending his technical ability to any prospective employer. 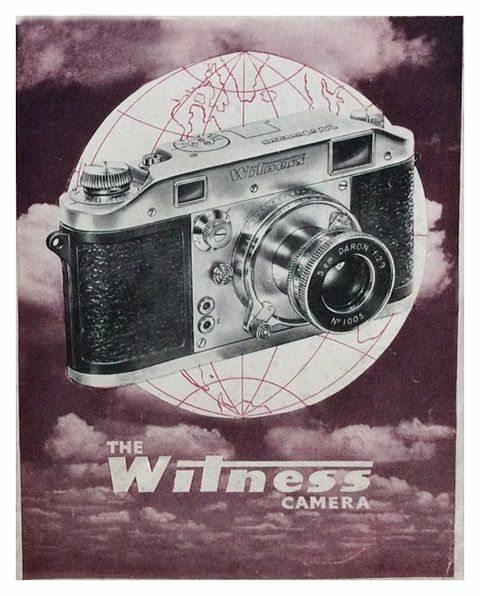 The following images are of a marketing 'Flyer' for the Witness. 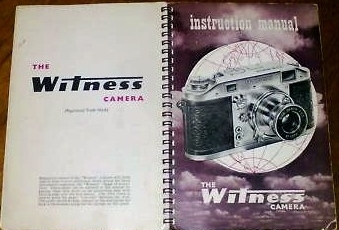 Notice that the Witness body is shown fitted with the original f2.9 Daron lens. The cover image is shown above. Below are the inside pages. To the right is shown the back page. Below is a photograph taken by Robert Sternberg's brother, Adolf Sternberg (born 1918), who was a professional photographer in Manchester. The original print, sized 12 x 15 inches, is now in the possession of Hilary Sternberg. As Hilary says "I wonder who owns this Witness now". Below is an Ilford Witness inside a glass case at the National Media Museum at Bradford, surrounded by other 35mm exotica. 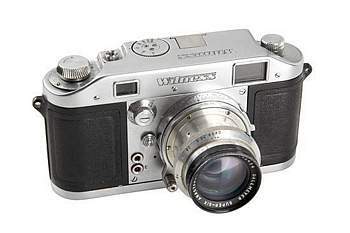 This camera, and the one shown immediately below, are both fitted with the f1.9 Dallmeyer Super-Six lens, as became standard by 1953 when the camera was being manufactured by Peto Scott. 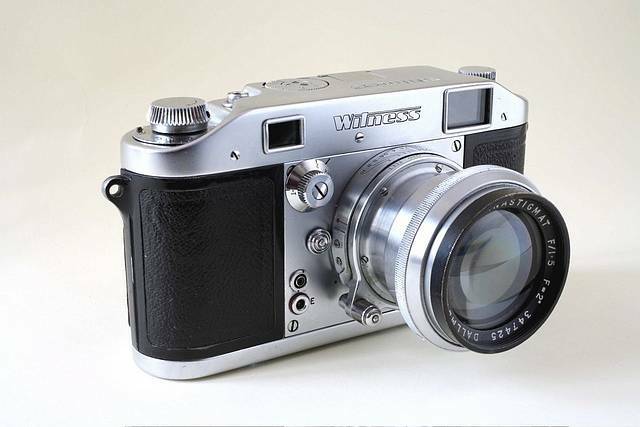 A Witness fitted with the original f2.9 Daron lens. The more usual standard lens found with Witness cameras is the f1.9 Dallmeyer Super-Six, as can be seen standing vertically in the picture here and in the Witness image immediately above. 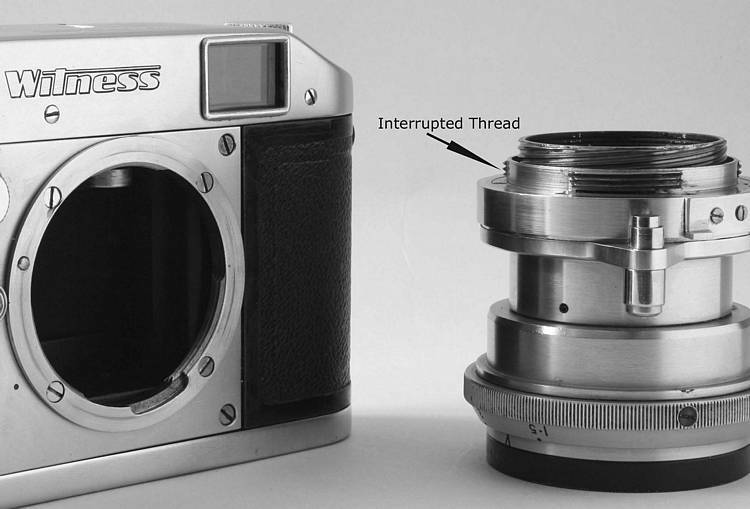 The camera shown alongside (left) is fitted with the scarce British "Dallmeyer" f1.5 2" focal length 'SEPTAC' lens with the unique Witness 'interrupted thread' screw fitting. This was a very fast lens at the time and matched the equivalent fast Leitz and Zeiss designs. 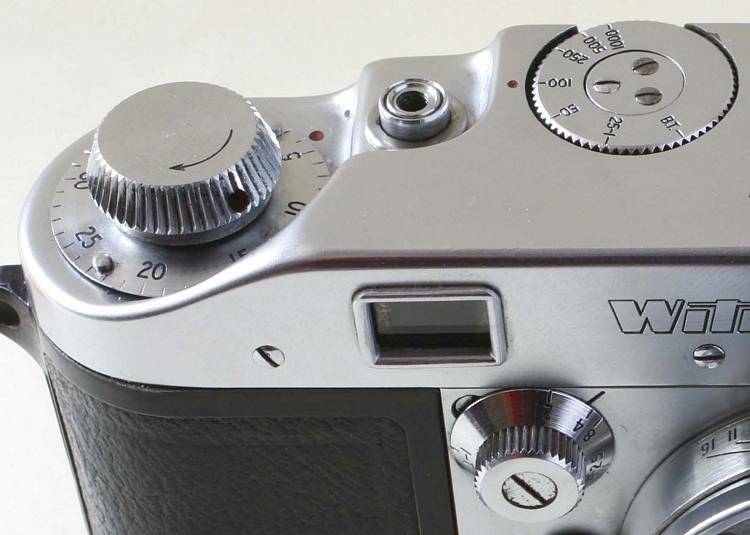 This Witness is owned by PCCI member 'Dunk', a regular contributor to the Rangefinder Forum. Its serial number is 5025. This excellent picture, and the others below, were taken by PCCI member John Dodkins using his Canon 5D. The lighting set-up was by 'Dunk'. For possible valuation of a Septac see here. Witness with original Daron f2.9 'collapsible' lens in the extended (ready for use) position, with the Dallmeyer f1.5 Septac lens alongside. Daron f2.9 lens 'collapsed' to enable closure of the camera's 'Every Ready' case. Dunk comments that the "camera is much better balanced with the collapsible Daron lens attached. 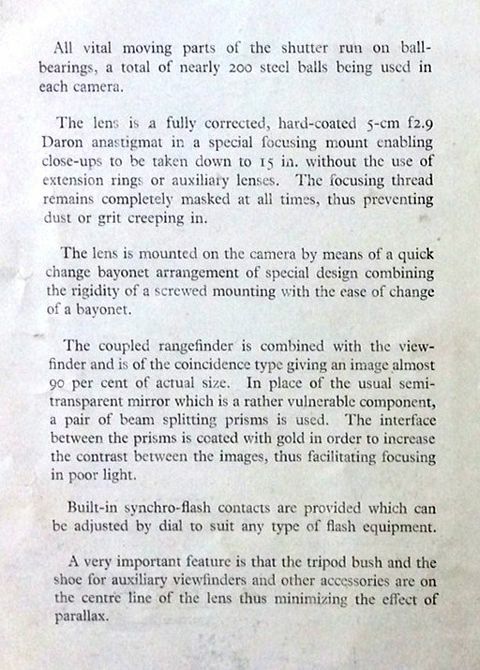 With the Septac lens fitted the camera will not sit without tipping forward". The Witness lens attaches via a Leica size 39mm thread which is compatible in all respects (focal register and rangefinder coupling) with the Leica screw fitting, but has a novel 'interrupted thread' which combines the attributes of a bayonet and a screw fitting. The Septac lens is 'front down' to show the 'interrupted thread' which enables the Leica screw thread lens to be quickly bayoneted to the body (interrupted thread not to be confused with the inner focusing helicoil). The Witness has a horizontal running cloth focal plane shutter (see below), with speeds from 1sec to 1/1000th sec. The faster speeds are selected using the top mounted non-rotating speed dial. A slow speed dial is on the upper front of the camera (see picture). This dial (with the top dial in the 1/25-1 position), allows the setting of speeds 1sec, 1/2sec 1/4sec and 1/8sec. With the top dial set at B.T. the front slow speed dial allows the selection of Bulb or Time exposures. Accessible on the inside base of the camera is a dial which enables selectiion of the delay time between firing the shutter and the 'closing' of the flash contacts to fire the flash. The case is the only part of a Witness that bears the name Ilford. Dunk reports that his "... case needed repair. 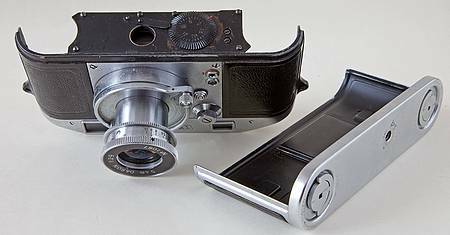 One reason the case was split was that it had been used with the Dallmeyer Septac lens which was slightly too long for it and had pushed the front out. The case is probably more scarce than the camera".